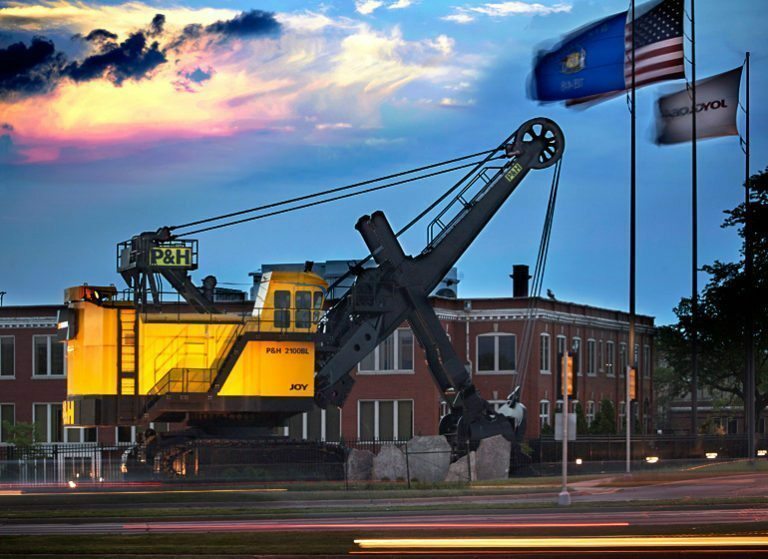 Accourding to the BizTimes there have been a lot of depressing headlines for the Milwaukee-area mining equipment manufacturing operations of Joy Global Inc. and Caterpillar Inc. over the past year. Milwaukee-based Joy posted a $1.2 billion loss last year, closed its Orchard Street plant, laid off the workers in its heavy fabrication and welding departments in September, and then closed those departments in May. Joy Global did have some positive news in the first half of 2016, reporting on its June earnings call it had received orders for two mining shovels headed to the Canadian oil sands and another for a longwall system in India that had been in the works for five years. The two projects were worth almost $150 million, but the company also said Canadian wildfires cost it $10 million to $15 million in revenue for the year. Peoria, Ill.-based Caterpillar reported its 2015 profit was down 43 percent from 2014. The results included an $88 million operating loss for the resource industries segment that includes the former South Milwaukee-based Bucyrus International Inc. mining equipment manufacturing business it acquired in 2011. Caterpillar plans to cut 10,000 jobs by 2018 and is closing its mining equipment corporate office in Oak Creek and moving 250 administrative jobs from there to South Milwaukee. Caterpillar also announced in May it would be moving engineering jobs from South Milwaukee to Arizona. South Milwaukee mayor Erik Brooks said the company told him 200 jobs would leave his city, with most transitioning in 2018. Of course, Joy and Cat, or their local predecessors Harnischfeger Industries Inc. and Bucyrus International, are no strangers to challenging times or the cycles of the mining industry. Both local companies filed for bankruptcy in the 1990s and both grew substantially from around 2004 to 2012. Given the industry they serve is known for its cyclical nature, it should not be a surprise that the two companies are taking actions to remain competitive. Those actions are even less surprising given the number of forces driving commodity prices down and leading their customers to hold off on investments in new equipment. While the mining industry’s downturn started in 2013, prices for the major commodities served by Joy’s customers still fell between 20 and 30 percent in 2015. Slower growth in China and a number of challenges for the U.S. coal industry mean both markets are undergoing a restructuring that will reshape them for the long term. “We do not see a return to the supercycle of the past,” Joy Global said in a statement, adding customers have a new level of discipline to control their capital requirements. “Oversupplied markets will rebalance eventually and the cycle will improve in time for most of the commodities we serve to fuel global growth,” the company said. Joy Global only agreed to answer questions for this story by email. Caterpillar declined to participate. The spate of bad headlines for the companies dates back even further, to the 2012 peak of the mining boom that fueled growth over the past decade for the mining equipment manufacturers. In 2013, Caterpillar dealt with an extended contract negotiation that included the union formally rejecting the company’s offer. Just after the contract was approved, 260 employees were laid off from the South Milwaukee facility, and another 60 layoffs came in 2014. Caterpillar moved its global mining headquarters to Oak Creek after acquiring Bucyrus, but announced the closure of the facility last year. The engineering activities currently in the area are moving to Arizona. The manufacturing work in Milwaukee still includes electric rope shovels and draglines, along with aftermarket parts for each. Each company has around 900 local employees and the local unions for both companies now have about 230 members working at each plant. The shrinking local workforce and changing nature of the industry raise the question of whether these two companies, with a local lineage dating back more than 100 years, will continue to have a presence in the area. Former Bucyrus chief executive officer Tim Sullivan said the commodities market is bottoming out now. While 2017 will likely still be tough, he expects things to pick up in the following two years and predicted both Joy and Caterpillar would be hiring and making more mining equipment in three years. But Sullivan also cautioned that the mining equipment industry won’t return to the levels it was at when it peaked. “We will never (again) see what happened in the last decade,” he said. “What happened” was the growth of emerging markets, particularly China. Sullivan said previous spikes in commodities have been driven by the industrialization of countries and regions, but nothing on the level of China (population: 1.35 billion) had been seen since the industrialization of the U.S. Under normal circumstances, the subprime mortgage bubble in the United States should have slowed commodities, but Sullivan said the growth from China was strong enough to sustain the higher levels the industry was experiencing. The two companies went to new heights on the strength of China’s growth and strong demand for commodities. In 2001, Bucyrus had $290 million in revenue and 1,600 employees. In 2010, the last full year before Caterpillar acquired the company, revenue was up to $3.7 billion and the headcount was 9,800. Caterpillar’s resource industries segment had $15.6 billion in revenue in 2011 and topped out at $21.2 billion in 2012. Joy Global announced last year it would close its Orchard Street facility and move the work to Texas. Joy Global also topped out in 2012, reaching $5.7 billion in revenue, with a worldwide workforce of 18,019. Revenue had been $1.1 billion in 2001, with a workforce of 7,240. The growth wasn’t all organic; both companies made a series of acquisitions to get them where they are today. For Bucyrus, those included Terex Mining in 2010, adding hydraulic excavators and off-highway trucks to its line. The company also acquired underground coal system provider DBT in 2007. Caterpillar also added Chinese underground support maker Siwei in 2012, although that deal ran into issues related to the company’s accounting. Joy Global’s acquisitions included Montabert, a maker of hydraulic rock breakers, in 2015 and LeTorneau Technologies, a maker of large wheel loaders, in 2011. Al Cervero, vice president for construction, utility and mining at the Association of Equipment Manufacturers, said a lot of consolidation has been taking place in the industry, but there’s enough competition to make it healthy and successful. “That consolidation is going to serve the industry well,” he said, adding that both Caterpillar and Joy have developed broad lines of product offerings. The companies may have broadened their lines, but both also have plenty of exposure to the coal industry. The combination of falling coal prices, a slowdown in China’s growth and the general oversupply of commodities have sent prices tumbling in recent years. “I don’t think anyone anticipated the degree to which (the market for coal) was going to go down in 2013,” said David Mitchell, president of Milwaukee-based Monarch Corp., a supplier to both Joy and Caterpillar. U.S. coal production is off 32.5 percent this year. The 896 million short tons produced in 2015 were down 11 percent from 2012 and 23 percent from 2008. “You have to know what you’re doing or you’re going to run into financial difficulty,” he said. Joy Global has facilities on 40 acres near National Avenue and Miller Park Way. Mitchell said he sees differences in how the two companies are approaching their future. In closing its heavy fabrication and welding departments, Joy is signaling it will rely on suppliers like Monarch, a supplier for fabrication, machining and assembly of heavy components, to provide those services. Caterpillar, on the other hand, has opted to keep the capacity to make big parts and components for its machines, Mitchell said, noting that as a much larger company, Caterpillar has a bigger footprint to draw on. Even though the South Milwaukee facility has capabilities Caterpillar doesn’t have elsewhere, members of United Steelworkers Local 1343, the union representing workers at the plant, are on edge about the future. “The membership is pretty nervous right now,” said Brad Dorff, Local 1343 president. He said the nerves are more about the state of the industry than anything the company is doing. A few years ago, the union had more than 800 workers at Caterpillar; now, there are 230 members working there. The looming departure of engineering jobs certainly doesn’t ease the nerves, but the company has said it will continue manufacturing in South Milwaukee. There also has been some good news. Dorff recently found out nine people would be recalled from layoff. The need for the returning employees came from retirements and some increase in orders for parts. The company also recently invested in a $5 million gear-cutting machine and in other upgrades. “It’s more than just putting paint on the walls,” Dorff said, although he added the union realizes machines could be moved if the company wanted to do so. He also said the relationship between the company and the union has changed since Sullivan ran Bucryus and it has been difficult to manage at times. Chris Chappelle, United Steelworkers Local 1114 president, said the attitude among members at Joy Global is one of fear, worry and feeling let down. Having been laid off five times himself, Chappelle said he understands the industry is cyclical. The two companies have taken differing approaches to working with their local unions, said Ross Winklbauer, USW sub-district director for both unions. Caterpillar has taken a very direct approach, providing notice and then laying people off, he said. Joy Global, on the other hand, has offered buyouts and severance not just for employees in the facilities it is shutting down, but throughout the local workforce. As a result, some of the younger laid off workers have had a chance to return to work. “Joy Global tried to hold on to their employees for quite a while,” Winklbauer said. Chappelle said the relationship between the union and Joy Global has been decent over the past 15 years, but also said the management team has increasingly been brought in from the outside, hampering the relationship. “They’ve gone global,” he said, and the focus seems to be on China and the LeTorneau operations in Texas. Joy is in the midst of attempting to find $100 million in cost savings through the optimization of its manufacturing footprint. A few years ago, the company was able to support $6 billion in revenue, but the downturn has reached a point at which guidance for 2016 calls for $2.4 billion to $2.6 billion in revenue and utilization of its manufacturing capacity is around 25 or 30 percent. The goal is to reach 75 percent utilization and support $4 billion to $4.5 billion in revenue. Analysts at Milwaukee-based Robert W. Baird & Co. Inc. suggest that would require the elimination of 2.5 to 3 million square feet. Joy has almost 1.3 million square feet in the Milwaukee area, among facilities in West Milwaukee, Oak Creek, downtown Milwaukee and on 84th Street. Asked if the planned footprint reductions could include the closure or reduction in size of the 40-acre facility on National Avenue, Joy Global said it evaluates business and workload on a regular basis, adjusting as necessary to remain competitive. “We evaluate our global operations for safety, quality and performance metrics, and our Milwaukee operations are performing very well in this respect,” the company said. Chappelle said the fact that the National Avenue location is in a prominent place near Miller Park, the Menomonee Valley and plenty of commercial development isn’t lost on employees. “That’s another thing in the back of everyone’s mind,” he said of the potential real estate value of the site. The company has about 900 employees in the area. Manufacturing activities include the machining of gears, shafts, rollers, motor frames and hoist drums. Blasthole drill assembly and heat treat operations also take place here, in addition to distribution, engineering, product management, quality, supply chain, sales and other administrative functions. Winklbauer said the union is hopeful both companies will continue to have operations in the area, noting both have had similar slumps in the past. Sullivan said he believes Caterpillar and Joy will stay. Sullivan said he feels Joy Global, in particular, is making the right moves, noting it has invested in hard rock and shifted toward commodities that are not as replaceable as coal. Mitchell said he sees Joy’s moves as a reaction to the market and an effort to remake itself for the future. “It’s a positive that they’re doing this, because it means they understand they need to be around for the long term,” he said. Mining equipment is trending toward incorporating more technology to improve efficiency. That includes autonomous or remote-controlled trucks to haul material away or other systems that limit downtime. “With some of these continuous mining systems, you can be pretty darn efficient,” said Lance Roberts, head of the Mining Engineering and Management Department at South Dakota School of Mines and Technology. Roberts said it will become increasingly challenging to remove material from mines and that creates demand for new, more advanced equipment. “For the most part, we’ve probably mined the easy stuff,” he said. Joy Global’s newest products have included underground hard rock loaders, a surface hybrid excavator and more efficient electric drive technology. The company’s JoySmart Solutions offering also integrates smart connected products, advanced analytics and direct service to help customers eliminate costs and improve productivity. “As an essential partner to the mining industry, we are focused on solving our customers’ toughest challenges, as our success is dependent on their success,” the company said. Sullivan, Monarch’s Mitchell and AEM’s Cervero all indicated they expect commodity prices to return at some point, but which level will represent the new normal remains a question. Mitchell said the infusion of technology into the industry won’t eliminate the need for the big pieces his company produces. “All of that stuff is still going to require large, manufactured steel components,” he said, although it will be more common to build large parts closer to where they will ultimately be used to reduce shipping costs. Mitchell doesn’t see automation reaching a point at which it is cost efficient enough to replace the welders he uses to build 170,000-pound crawler frames. “We’re not going to get there for a while and even when we get there, we’re still going to need the highly-skilled labor that understands the process,” he said. Cervero sees the potential for a different future. “I will not say that you will continue to see the need for somebody to put weldments together,” he said, adding that his organization is working with researchers to 3-D print a boom for an excavator next spring. “I don’t know what those jobs are going to be. There are going to be jobs, but instead of a welder you may be a 3-D printer,” Cervero said. Winklbauer said the pressure from 3-D printing and automation is not just something that could threaten workers at Joy and Caterpillar; It is a threat to workers throughout manufacturing. But human workers still have tremendous value, he said. “I’ve never seen a robot being able to crawl into a very tight corner and do the kind skilled welding our men and women do at Joy Global and Caterpillar,” Winklbauer said.